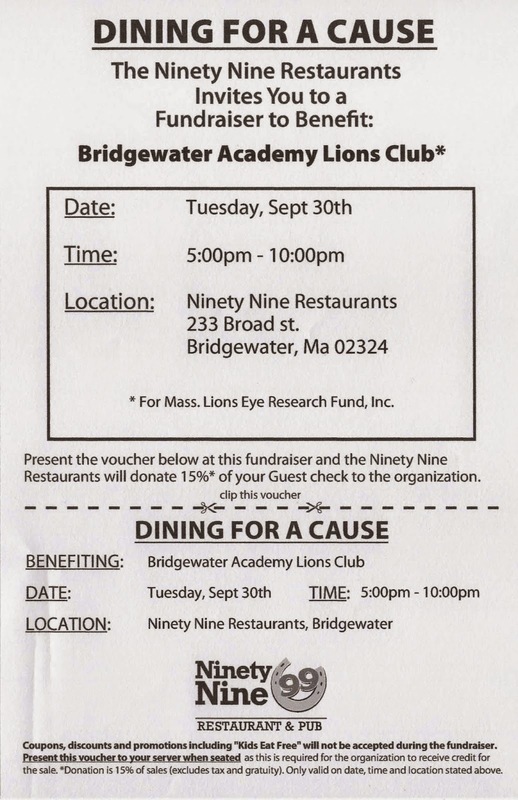 Join the Bridgewater Academy Lions Club at their "Dining for a Cause" event on September 30th from 5-10 PM at The 99 Restaurant at Campus Plaza. The 15% proceeds from this event will benefit Massachusetts Lions Eye Research Fund, Inc. The Bridgewater Academy Lions Club hopes that people interested in supporting this event will print out the flyer and bring it with them when they order. All the details are on the flyer. For any questions, please feel free to email bwateracadlions@verizon.net.